These Sweet Potato Fries are so delicious and crispy. If you love sweet potatoes, you'll love these fries because they're simple, flavorful, made in the oven and the perfect side dish to any meal. 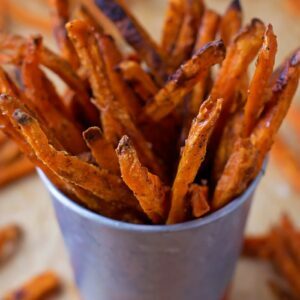 Place the raw sweet potato sticks in a large bowl add enough cold water to cover the fries, then sprinkle 2 tsp. of the salt over the top. Allow to sit for 1 hour, or more time if possible. Preheat oven to 450 degrees. Place a rimmed cookie sheet (standard size) in the oven to heat. Cut a piece of parchment paper to fit the sheet, set aside. Drain the fries and place in a large plastic bag with the cornstarch, paprika, garlic, black pepper, cayenne pepper, coriander and cumin. Leave a little bit of air in the bag, zip and shake until evenly coated. Use the same bowl to toss the fries in the oil. Remove the sheet from the oven, place the parchment paper over top and then carefully toss the fries on, making sure they have space in between to bake (you don't want them to steam). Bake for 20 minutes, toss, then bake for 10-15 minutes more, or until crisp and golden brown. Remove from the oven, sprinkle with sea salt and allow to cool for 5 minutes before serving. Enjoy immediately!